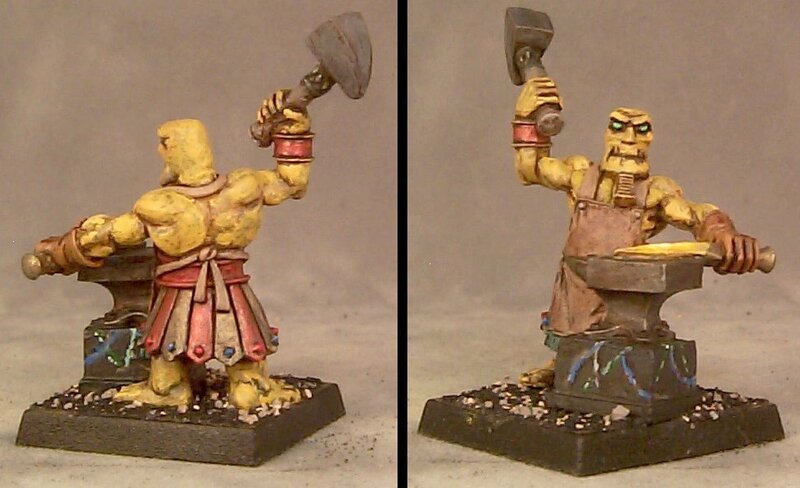 2010 WarGods Event Mini Artifex Done! 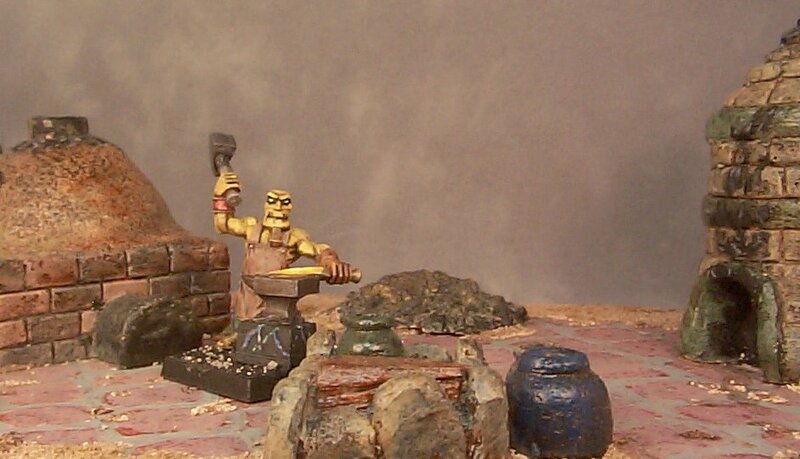 Who's this hanging out at the "Forge of the Minismith" special terrain feature? Why it's the 2010 Event Mini from Crocodile games! It's pretty sad that this guy I picked up at GenCon a few weeks ago has been converted and painted up while the normal Artifex mini has been partially painted for over a year. I tried to give the weapon he's working on a glowing white hot metal look. I'm not sure how good it came out but it doesn't look horrible. at least. I toyed with the idea of putting a goofy hieroglyphic message on his apron ("kiss the artifex" or "I do it with molten metal") but I decided against it since he's kind of serious. He was really fun to paint, I think I may have to finish off the rest of my To-Tanem now (spears and the official Artifex sculpt). I'm obsessed with converting minis, I can't help myself. Often it's just a stupid little change that most people won't notice but MUST be done. 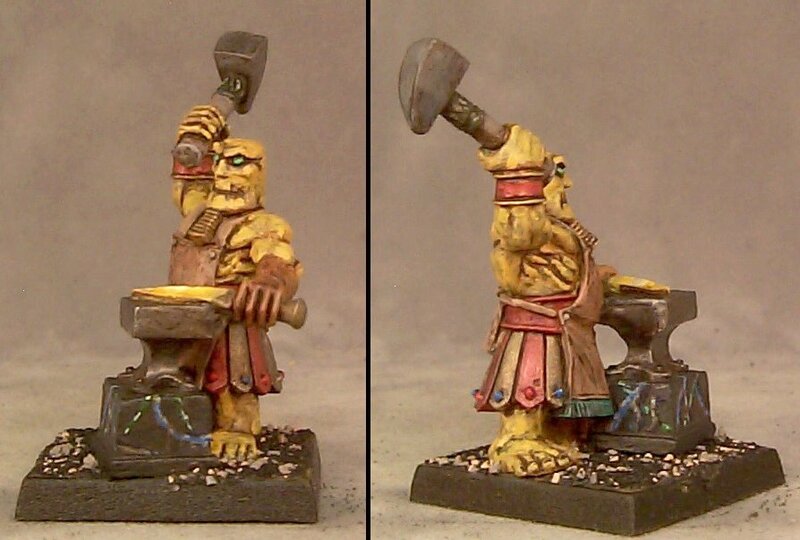 Like on the "Artifex Working" WarGods 2010 event miniature. I love everything about the fig but the hammer head. So I swapped it out for what I feel is a more appropriate hammer head. Simple and it makes me very happy. 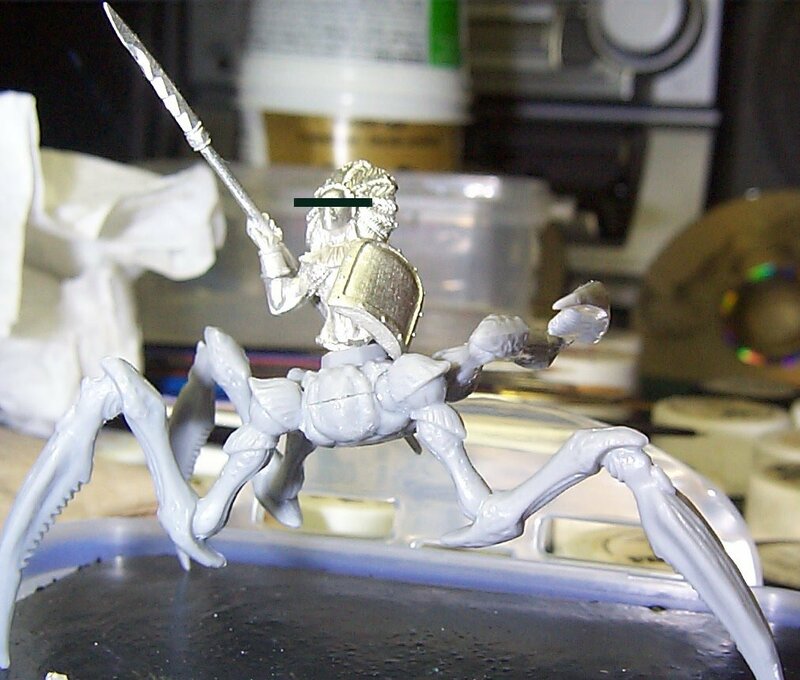 Then there's the more elaborate conversion to come up with an Aspect of the Hunter mini. Even though I only have one unit of actual Typhon (the OOP Archers) I still feel the need to do a Hunter conversion since I've done a Heru Aspect of the Defender conversion. She needs a nemesis even if it's only on a shelf. I got a box of Starship Trooper bugs at GenCon in hopes of using one of them as the main body of the conversion. After fiddling with various leg configurations I decided to go with one leg in a "preparing to strike" pose since there's not going to be a massive scorpion-like tail. And here is the body part loosly attached to give an idea of what the final figure might look like, but I won't reveal the exact mini it is until after she's completed. I still need to do something about the torso/thorax joint- I'm thinking of sculpting some fur to cover that area and maybe adding a weapon or bow and quiver. After drooling over pictures of them over the last few months, I picked up a box of Wargames Factory Shock Troops plastic multi-part minis at GenCon. I had no real plan for them I was just interested in the chance to customize some generic sci-fi troopers because converting is its own reward. I finally got around to cutting some off the sprues and sticking them together the other night. I present the Cthood Scout Party- maybe the start of an entire army of squid-headed dudes or perhaps just a small mercenary force, I'm really not sure yet. All I know is that these were really fun to put together. This first guy was pretty straight forward so I could get a feel for how all the pieces could fit together. Thanks to Brian Roe for the suggestion to put olde Warzone plastic Bauhaus packs on the Shock Troops- they fit wonderfully and look just right. 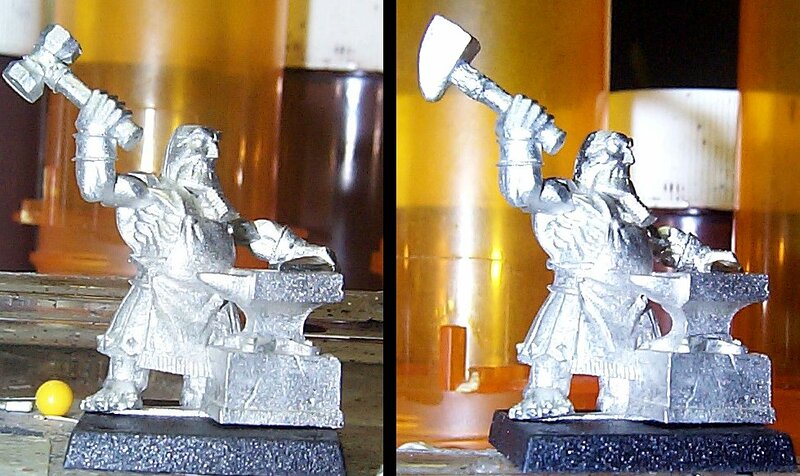 The second guy was also pretty standard, except for his sprue-bit goggles. Since there is only one Cthulu head on each sprue I tried to think of something to help make a simple variant. For some reason I thought goggles would be a good choice and I'm pretty happy with them. No pack for this guy since I've only got a few left and I want some variation among the troops. For the third guy I got a little crazy. I studied the pointing arm but did not like how it pointed straight out to the left. After some planning I made a few cuts and reconstructed the arm so it would be pointing more to the front. I kept hearing him shout "down on the floor!" or "mine!" or something to that effect as he came together. He got a Warzone pack because with his action pose it seemed the best choice. Since there are only six Cthulu heads in a box I decided to slow down and use one of the helmeted heads. I chose this mask variant because it looks like it could fit the tentacles inside, that's why it's wider at the bottom. So now I have a way to get a whole box full of Cthood without 'wasting' any of the bare heads. I'm not terribly fond of the special weapon designs in the box so I looked through my vast armory and came across this plastic Ork gun. It looks pretty good as a heavy weapon so I trimmed a regular rifle arm so the big gun would fit and modified the left arm so it would be able to 'hold' the barrel. The extra ammo drum is another sprue creation (it's the virtually same size as the drum on the gun) along with his targeting monocle. Now that they're assembled and primed hopefully they'll be painted soon so they'll be ready for a little skirmish.